High-end websites now available to everyone! One of the biggest challenges both small and medium businesses have, when it comes to getting a custom website developed inclusive of things like e-commerce, email marketing, website optimisation, website promotion plus web hosting and maintenance, is the affordability factor. Getting a professional website when including all the parts necessary for a successful online presence can be quite expensive. Without compromising on quality, we offer a full-service package that includes the design and creation of a professional website with the latest technologies, not from templates, including the dedicated and managed web hosting + website maintenance. You can even opt-in for our SEO services as surely you want your website to be found in Google. Skimp on the important things that are critical to driving business to a website such as email marketing systems and website optimisation. Turn to companies offering cheap, generic looking websites thrown together without much thought for how the site is supposed to consistently deliver the brand’s message, generate leads or process transactions online in a secure and efficient manner. So what’s a business to do when they obviously need to be able to compete effectively in the digital age without exhausting much needed working capital? 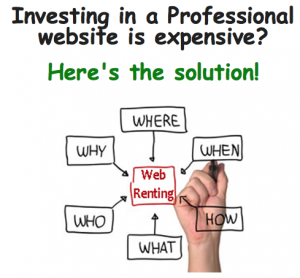 The answer may be to rent your website. Renting simply doesn’t come to mind. Traditionally, when people think about renting they think about leasing tangible products like cars, computer hardware and office equipment. Many banks won’t finance an intangible asset. Websites, much like software, are seen as intangible assets for which most banks will refuse to provide lease financing because it’s not something that they can easily sell should you not be able to pay. Financing is difficult in this market. Even if financing was available on an intangible asset like a website, getting approved in this economy requires great credit on behalf of the borrower. Confusing terms can cost you. Many leases are written to favor the lender, not the borrower which means that you could find yourself paying outrageous fees to purchase the asset outright, get stuck with high interest rates or fall under terms that automatically renew themselves for many more years. Knowing that companies of all sizes are looking for ways to compete online, we developed a website rent program to make obtaining a successful online presence, at an affordable monthly price, a possibility. We’ll take a look at what it is, how it works and how your business can benefit. Renting a website is very similar to paying a monthly subscription fee. Instead of paying a lump sum for your website up front or incurring setup fees, you pay a much lower monthly fee for a set period of time. Optimasit offers website leases for 1, 2 & 3 year terms with the longer the lease term the lower the price. How Can My Business Benefit from Renting a Website? Getting all the tools needed to build, promote and maintain a successful online presence can be a significant investment. Optimasit’s website rent option provides the ability for you to now afford those tools that will give you the best chance at success on the Internet while preserving your working capital. The website lease is a great option even if you’re use to owning and paying for everything up front. After the lease period is over you have the option to buyout the website, continue month to month or walk away. Since no banks are involved and no credit checks are required, there’s really not much stopping you from getting into a website rent! This offer is also available for Real Estate businesses who would like to benefit from the most complete and modern CRM solution (Optima-CRM), with full website integration, allowing you to manage everything in your business from within one solution…including all web content.